A barbed, large headed insert available in extra short lengths in a range of thread sizes from M2 to M10. The Microbarb incorporates the same features as the headed Multisert range but with a shorter overall length. This means it is optimised for pull through applications in thin section materials due to the full size head geometry. The design incorporates a larger head and barb diameter to provide increased bearing surfaces. For larger thread sizes the back of the head is chamfered to reduce the apparent projection. 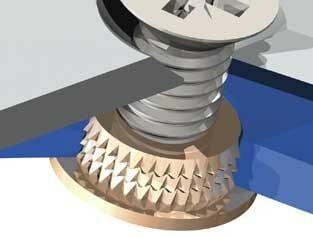 Maximum thread engagement is achieved by countersinking the limited thread length at only one end. To provide optimum performance the plastic component’s material section should be designed to be slightly in excess of the Microbarb under-head length. This ensures that upon assembly a clamp with the mating part is achieved, whilst limiting the compression of the plastic itself. The Microbarb is ideal for use in vacuum formed, rotational moulded and fabricated components in either Thermoplastic or Thermoset materials (the latter , we recommend heat-installed). The Microbarb Multisert has been designed with a larger head and barb diameter and is a development of the highly successful Multisert® that provides increased bearing surfaces in thin section materials. The insert can be pressed-in cold or with heat and is primarily used in a pull through mode in thermoplastics but has limitations in thermosets – may be acceptable if they have with a tensile strength of less than 100Mpa and some degree of resilience. Description: The Microbarb Multisert has larger head and barb diameter to provide increased bearing surfaces. Application: Designed for use in thin section thermoplastic and some thermoset materials. Ideal for Vacuum formed, Rotational moulded and fabricated parts, where the insert is installed in one direction and the bolt assembled from the other end, giving maximum pull-out loading. Hole Size: Moulded and drilled hole diameters vary dependent upon the nature of the final assembly, component geometry and plastic material. Please consult our technical department for a precise recommendation, to ensure optimum production conditions.Sizes given are for reference purposes only. Installation: This insert can be used for heat or push in installation depending on the plastic material.